The Cottages at Edgewood is a memory care community that combines the best features of both adult family homes and commercial assisted living communities. Here you will find an intimate environment where residents receive individual attention provided by a professionally managed, highly trained and compassionate staff. 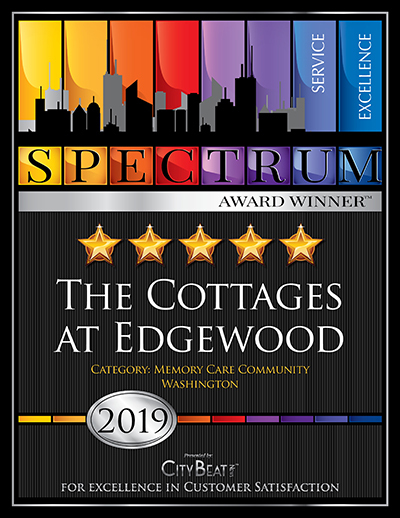 The Cottages At Edgewood in Edgewood, WA has won the 2019 Spectrum Award for excellence in customer service and earned a rating of 5 out of 5 stars. This coveted service award was presented to The Cottages At Edgewood by City Beat News.